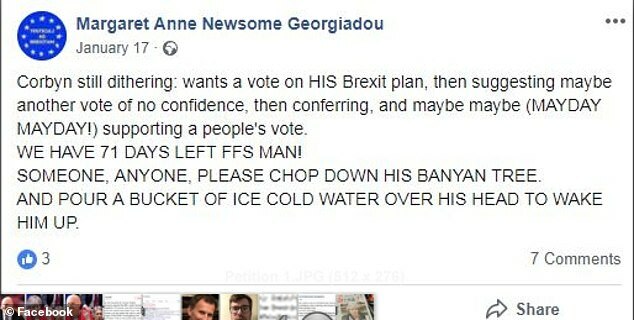 The woman behind a three-million strong online petition to stop Brexit reportedly made Facebook posts in which she threatened to shoot the Prime Minister. Former college lecturer Margaret Anne Georgiadou also said that Theresa May ‘needs putting down’ after the politician lost he first meaningful vote in January, according to the Guido Fawkes website. 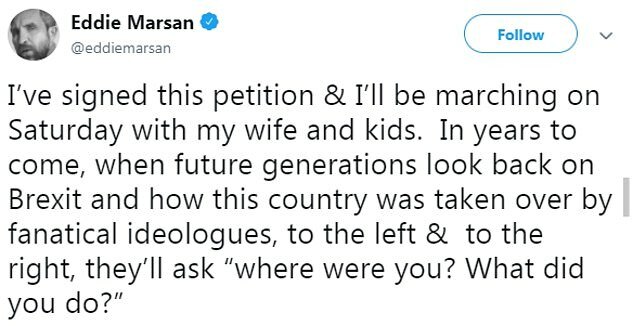 It came as her petition, backed by a host of celebrities including Hugh Grant, went viral online on Friday, less than two days after being launched. 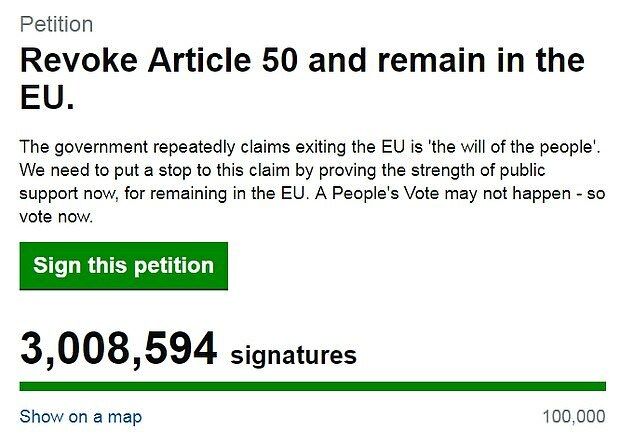 It passed three million signatures shortly after noon today but but Remainer hopes of it making a difference had already been dashed as Mrs May last night ruled out cancelling the Brexit countdown. 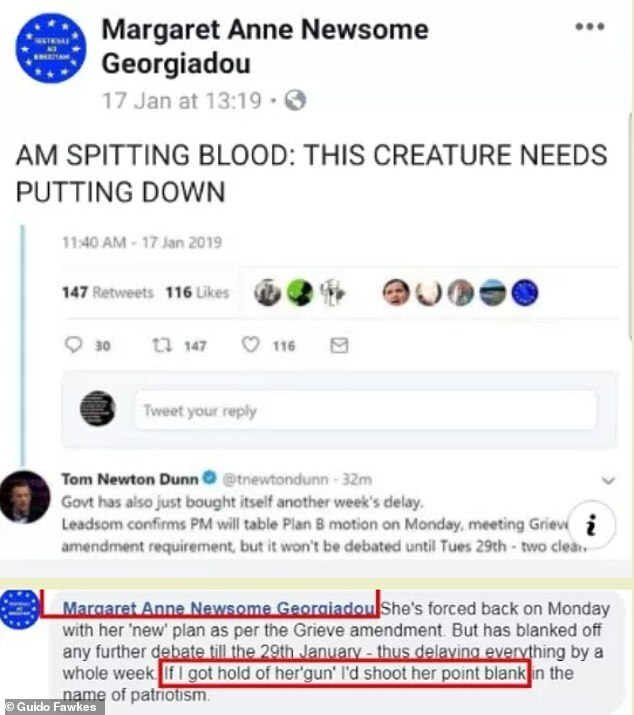 In Facebook posts obtained by Guido, Ms Georgiadou reacted to news that Theresa May was seeking a delay after losing her first meaningful vote by a record amount, writing: ‘Am spitting blood: this creature needs putting down. She later wrote: ‘If i got hold of her ‘gun’ I’d shoot her point blank in the name of patriotism. The petition has also been backed by physicist Brian Cox, actress Jennifer Saunders, singer Annie Lennox, actors Eddie Marsan and Andy Serkis and author AC Grayling. Facebook posts also show Ms Georgiadou criticised Labour leader Jeremy Corbyn, accusing him of ‘dithering’ over his opposition to Brexit. 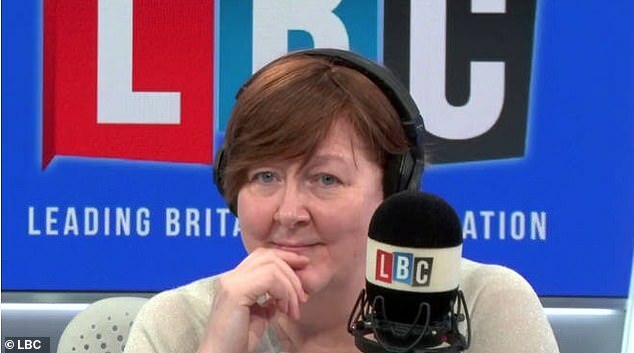 Ms Georgiadou appeared on LBC radio this afternoon, saying how she fed the petition by approaching ‘notable’ celebrities on Twitter for endorsements. She added: ‘The government ignored us, they didn’t have any discussion with Remainers. Despite hardline Brexiteers like Nigel Farage saying that the UK should leave on March 29 with or without a deal, they have yet to launch a counter-petition demanding there is no delay. With the highest sign-up rate on record, more than two million people had pledged their support by the time Mrs May fielded questions in Brussels last night. Asked whether she thought the public’s view had shifted towards revoking Article 50, Mrs May said: ‘If you look back to what happened in the referendum, we saw the biggest democratic exercise in our history. The latest petition is not the most popular one ever on the Parliament website. A petition for a second EU referendum in June 2016 attracted more than four million signatures and was debated in the Commons – but thousands of signatures were removed after it was discovered to have been hijacked by automated bots. Another popular petition aimed to prevent US President Donald Trump from making a state visit, and attracted 1.8million signatures. Professor Cox said: ‘I’ve signed this petition to revoke A50 and deal with the consequences afterwards – referendum, election, whatever. The petition on the Parliament website quickly gained support in the wake of the PM’s speech on Wednesday night and Revoke Article 50 started to trend on Twitter. The Brexit timetable: What happens next? After yesterday’s agreement to delay Brexit, Britain’s EU withdrawal is taking place to a new timetable. So what happens next? Today: Theresa May cuts short her attendance at the European Council summit in Brussels to return to the UK and embark on a drive to win over at least 75 MPs to her Brexit plan. Tomorrow: Large crowds of opponents of Brexit are expected to throng the streets of London for a Put It To The People march demanding a second referendum. Next Monday: Parliament debates an amendable Government motion on the Brexit deal, which gives MPs a chance to put their favoured outcomes to a vote. Mrs May could table secondary legislation which must go through the Commons and Lords by Friday to remove the date of March 29 from Brexit legislation. Mrs May’s effective deputy David Lidington has promised to introduce a process for MPs to debate potential Brexit outcomes over the following two weeks. 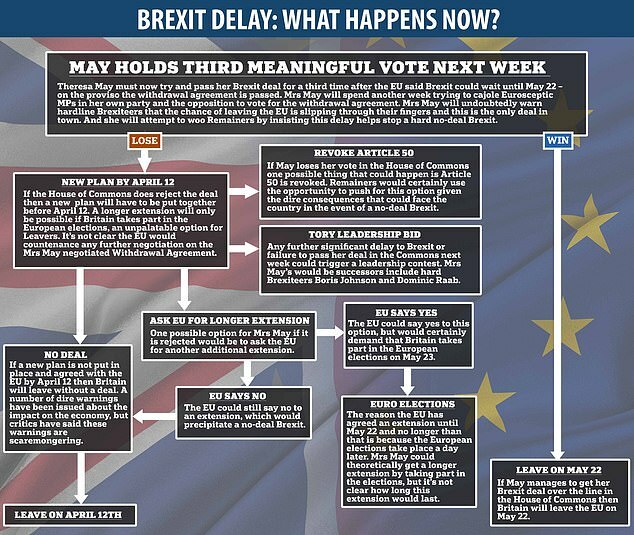 Next Tuesday: Possible date for the third ‘meaningful vote’ – known in Westminster as MV3 – on Mrs May’s Withdrawal Agreement. Downing Street says that no date has yet been fixed for the vote, which must come by the end of the week. Next Wednesday: MPs led by Sir Oliver Letwin hope to seize control of parliamentary time to force votes on Brexit options. Next Friday: No longer Brexit day. Leave-backing walkers who have taken part in the Brexit Betrayal march from Sunderland are due to arrive in London. April 11: Final date for the UK to take steps to enable European Parliament elections to take place. April 12: If Mrs May has failed to secure Commons support for her Withdrawal Agreement, this is the final day on which the UK can set out its next steps to the European Council, if it wishes to be granted a longer extension. If it does not do so, the UK would leave the EU without a deal. 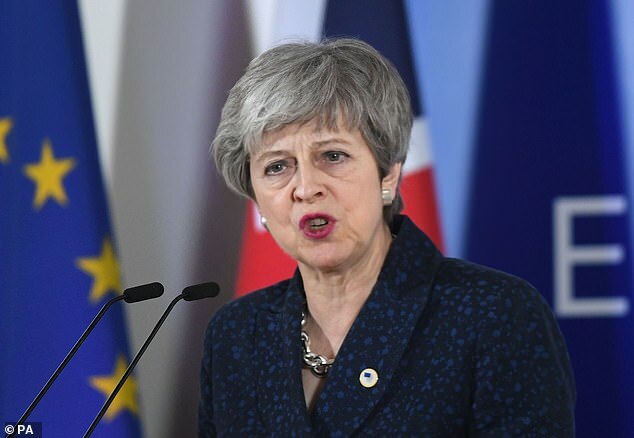 May 22: If the Commons has approved Mrs May’s deal, the UK formally leaves the European Union on this date with a Withdrawal Agreement, entering a transition period during which it will continue to observe EU laws but have no representation in EU institutions. May 23-26: European Parliament elections take place across the EU, with or without the UK. July 1: The first session of the new European Parliament, whose first task is to confirm a new commission and president. December 31, 2020: If the UK has left with a deal, this will be the end of the transition period. London and Brussels have both said they hope to have an agreement on future trade and security relations completed by this point. Commons Leader Andrea Leadsom dismissed the petition, pointing out it was not on the same scale as the referendum. ‘Should it reach 17.4million, I am sure there will be a very clear case for taking action,’ she said. 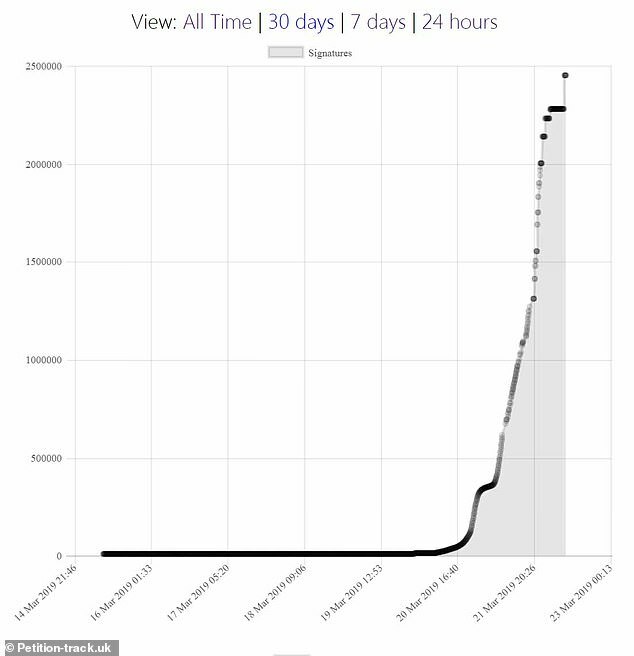 The Petitions Committee said nearly 2,000 signatures were being completed every minute over yesterday lunchtime, crashing the website because of the unprecedented hit-rate. Anyone can fill it in, prompting fears that bots or foreign agents seeking to interfere could have contributed to the total number of backers. But people signing petitions on the Parliament website were asked to tick a box saying they are a British citizen or UK resident and to confirm their name, email address, and postcode to sign. Data from the petitions website yesterday afternoon suggested more than 960,000 signatures were from people who said they were from the UK, nearly 9,000 from France, nearly 5,000 from Spain and nearly 4,000 from Germany, among others. Margaret Anne Georgiadou, who started the petition, told the BBC: ‘I became like every other Remainer – very frustrated that we’ve been silenced and ignored for so long. Yesterday, EU leaders said Brexit could be delayed from March 29 to May 22 – but only on the condition that MPs vote for Mrs May’s deal next week. If it is rejected in the third ‘meaningful vote’ then the UK would have until April 12 to tell the European Council a way forward. In January MPs debated whether the UK should leave the EU without a deal after a petition calling for it got 371,673 signatures. MPs have been sharing the petition to revoke Article 50 on social media, including Lib Dem Brexit spokesman Tom Brake. Pete Wishart, who was among a number of SNP MPs who shared the petition, called on the public to sign and ‘end the madness’. Referring to the TV speech, Mrs May said: ‘I expressed my frustrations and I know that MPs are frustrated too – they have difficult jobs to do. The PM added: ‘There are passionately held views on all sides. Labour MP Neil Coyle also urged people to back it. The SNP has tabled an amendment to revoke Article 50, which has been signed by 35 MPs. A House of Commons spokesman said: ‘We know that the petitions website has been experiencing problems due to the number of people using the site. ‘This is a mixture of people signing petitions and refreshing the site to see changes to the number of signatures. Pro-Brexit Tory MP Nadine Dorries suggested it was ‘likely’ that foreign governments or bots had intervened in the petition to revoke Article 50. ‘I don’t think you can trust the authenticity of any petition or social media response any longer as the issues regarding bots and rouge internet sabotage is now an everyday occurrence,’ she said. But the Commons spokesman added that signature patterns are investigated to check for fraudulent activity and suspect signatures are removed, including those that are ‘clearly bots’. In December last year the European Court of Justice ruled that the UK can unilaterally revoke Article 50 of the Treaty of the European Union and cancel the Brexit process. How much is Holly Willoughby paid for hosting This Morning, what is her net worth and how old is she?